The claim by the dissident republican group, calling itself the IRA, that it carried out a mortar attack on a police patrol in west Belfast at the weekend will not come as a surprise to the PSNI or the security services. Formed in the summer of 2012, it is the largest dissident group currently active. It was responsible for the murder of prison officer David Black as he drove along the M1 motorway on his way to work at Maghaberry prison in November 2012. The police said the mortar did not hit its intended target, a Land Rover, and that minimal damage was caused by shrapnel. In a statement, the organisation said that was not the case and the device did strike the vehicle. It said the device used was an explosively formed projectile, or EFP - a mortar design that has been used in the Middle East. It contains a conically shaped warhead capable of penetrating armour, and can be fired from a tripod or a tube. The device used in the attack on Friday night is believed to have been fired from a tube attached to railings at the City Cemetery on the Falls Road, and was detonated by command wire. The police and security services will be concerned that dissidents were able to mount this kind of attack. Many attempted attacks have been disrupted in recent years, but on this occasion four police officers inside the Land Rover appear to have had a very lucky escape. Security sources have persistently said these dissident groups are heavily infiltrated by informers, but this demonstrates that intelligence cannot be 100% accurate and there will be concern that this slipped through the net. The dissident statement claims the firing of the mortar was just one phase of the planned attack. It said members of what it calls an "active service unit" were in the area armed with automatic weapons and that they were there to attack any police officers who got out of the Land Rover. There is no way to verify that claim, but it will be of concern to the police. Sinn Féin has criticised the fact that it took the PSNI an hour and a half to cordon off the area around the scene of the attack, but the police approach such events with great caution as one attack is often used to lure them into a secondary attack. 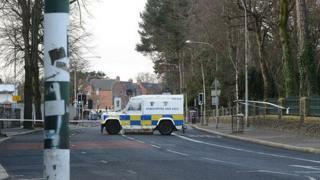 The police may will point to the dissident claim of a planned gun attack as justification for the delay in its response. The statement also claims the IRA has access to other similar mortar devices, and said the organisation will continue to target police officers. There was no mention of Semtex in the statement, but dissident sources have told the BBC that the device used on Friday contained a quantity of a newly acquired supply of the military grade explosive. If that is the case, that will be of huge concern to the police and security services. Huge covert resources have been deployed by the PSNI and MI5 to monitor the activities of dissident groups and a number of attempts to acquire new weapons have been foiled in recent years.